Holland Benevolent Society to Mr. S.J. Hoogland. Ripon Calif. Sept. 18, 1931.
being a member of the Holland Benevolent Society passed away Sept. 13, 1931. The funeral services will be held 2 uur [hour] at the Chr. Geref. Kerk Ripon Cal. [the Christian Reformed Church]. Miss the widow Schuiling asked me to give you knowledge concerning the death of her husband in a car accident. On a trip from Redlands where he was living at the moment to Ripon, his former residence, he lost, by yet unknown causes, control of the wheel and drove into a concrete railing with the sad end. Funeral took place Friday Sept. 18 in the Chr. Reformed Church in Ripon. 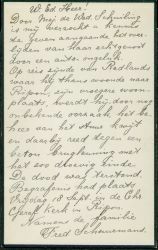 Mrs. Schuiling would like you to tell the children of Jantsje about the death of her husband. Maybe you'll remember the visit I paid you on an afternoon four years ago. It always is a pleasant memory for me. With regards Foeke Thomas Schuurmans.